Simparica gives superior protection against fleas and ticks with its fast speed of kill that lasts all month long. It also has the broadest external coverage of any chew, giving your pooch extra protection against mange and mites. 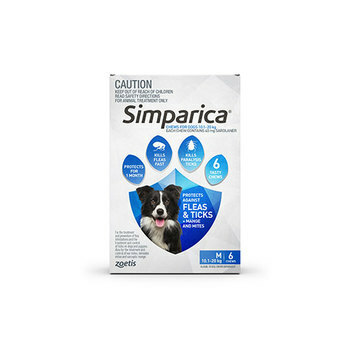 Simparica begins to kill adult fleas within 3 hours and ticks within 8 hours of administration, and is given monthly and requires a prescription from your veterinarian. Put simply, Simparica works fast and lasts. Simple.